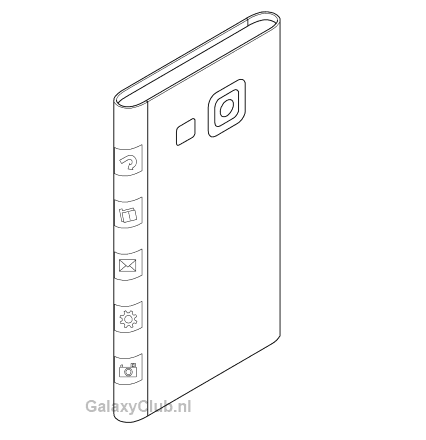 Last week a Samsung representative reported to the Korean Media that its upcoming flagship phablet, the Note 4, will feature a ‘new form factor’. Now a new patent application has surfaced on the web that allegedly showcases this new form factor and how the South Korean company is incorporating flexible display technology. As you can see from the drawing above, the concept handset features a Youm flexi-display that bends round the sides of the device and stops just before you get to the back. The sketch also shows that all of the ‘action keys’ will be located on the sides. This includes camera, contacts, settings and text messaging shortcuts. This latest revelation goes hand-in-hand with the last patent Samsung filed five months ago, in which it designed and implemented a brand new version of TouchWiz for smartphones with wraparound displays. Unfortunately, we don’t have any more information, but we’ll be sure to keep you up to date with the latest information on the Galaxy Note 4 when it breaks— after all, it’s one of the most-anticipated phones of 2014. So be sure to check back.